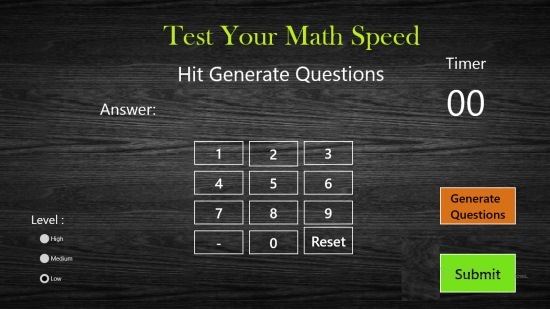 Test Your Maths Speed is a free Windows 8 Maths app. You can use this app to test your mathematical problem solving ability. You have the independence to select a difficulty level, according to which questions will appear in front of you. This app is more like a game in which you can see your mathematical problem solving skills competing against time, thus having fun at the same time. Test Your Maths Speed is freely available in the Education category of Windows Store. Let’s get you a better idea about this app. The app uses a simple interface to check your speed, with all the options being available at the main landing page of the app. On the main screen, right at the bottom left side of the app’s interface, the option to set your difficulty level is available. You can choose to have Low, Medium, or High level for the questions that may be given to you. This app provides you with some really good questions, right from the Low level. The questions would be of complex form. That means, all the questions appearing here would be having more than one operation involved (addition, subtraction, division, multiplication, and brackets). After that, use the Generate the Question option that is shown on the bottom right side of the app, and the app will get you a random question having complex operations (as discussed earlier). From the question that is give to you, make the necessary calculations, and when you are done and have a solution, you have to use your mouse or finger to input the answer with the keypad that is available in the app’s interface. Immediately after providing the solution, hit the Submit button. There is no option to input the result directly through the keyboard. This is a lagging point of the app. The app could have been a little better if there were an option to write your solution with a keyboard, because it could save the extra time which is otherwise wasted in using the app’s keypad. There is a Timer present in the app, that calculates the time you take to solve the problem. The timer starts as soon as the question is given to you. As you submit the answer, the timer stops if the answer is correct. Your time would be shown to you. The app will simply display a retry message if your answer is incorrect, along with the timer being continued until a correct answer is given. Also check Math Rush Basic Operations Lite. You can test your maths speed using this free app. There are three levels available to play this educational game. The Interface of the app is quite simple, with all the options available at the main screen only. Test Your Maths Speed is a nice Windows 8 Maths app. It will let you test your mathematical problems solving ability efficiently. Give it a try and share your views on it via comments.